This security poster illustrates the Tellermine 43 & Topfmine German Anti-Tank Mines. This security poster features a sectioned Topfmine showing the fuze in its wooden support resting on the PETN booster, the top of a Topfmine, the bottom of a Topfmine showing the glass plugs, a sectioned Tellermine 43 with the Tellerminezunder 42 fuze, a Tellermine 43 with the Z.Z.42 – Kippzunder, and a Tellerminezunder 43 showing the weak shear pin on the right side. The security poster also shows the technical specifications of both the Tellermine 43 and the Topfmine anti-tank mines. A sectioned Tellermine 43 with the Tellerminezunder 42 fuze. A Tellermine 43 with the Z.Z.42 – Kippzunder. A Tellerminezunder 43 showing the weak shear pin on the right side. A sectioned Topfmine showing the fuze in its wooden support resting on the PETN booster. The top of a Topfmine. The bottom of a Topfmine showing the glass plugs. The technical specifications of both the Tellermine 43 and the Topfmine anti-tank mines. 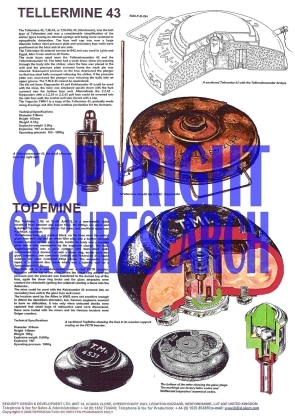 This security poster features the technical specifications of both the mines, a sectioned Topfmine, the top of a Topfmine, the bottom of a Topfmine, a sectioned Tellermine 43 with the Tellerminezunder 42 fuze, a Tellermine 43 with the Z.Z.42 - Kippzunder, and a Tellerminezunder 43.